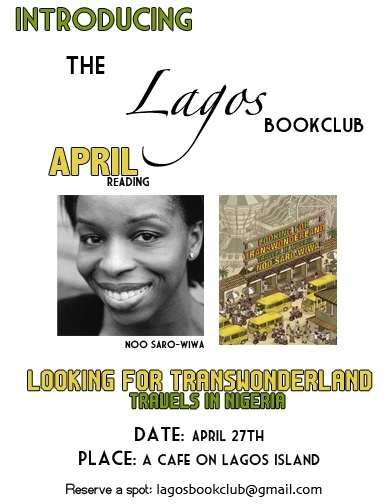 April's book is Looking for Transwonderland: Travels in Nigeria, a travel memoir by Noo Saro-Wiwa. It was published in 2012 by Granta. It was named one of the 10 best contemporary African books by the Guardian in 2012, chosen by the Financial Times Life & Arts as one of their Pick of the Crop and also by the Sunday Times as Travel Book of the Year 2012. It can be found in most major bookstores in Lagos. Noo Saro-Wiwa was born in Nigerian in 1976 and raised in England. She has written travel guides for Rough Guide and Lonely Planet. The first meeting is scheduled for Saturday April 27th. Venue, TBC, but it'll be in a cafe on Lagos Island. If you're interested in joining do send an email to lagosbookclub@gmail.com for more details and to also reserve a spot. What's there not to love? A place where book lovers can meet, share their interests and discuss books. And it's free :). If I was in Lagos, I'd definitely be there. So send an email, get a copy of the book (if you haven't already read it, it's a great book) and enjoy!!! Is this book club still operational?